Jared Covili has been a educational technology trainer at Utah Education Network in Salt Lake City, Utah for over a decade. He specializes in teaching strategies for classroom integration of technology such as Google learning tools, geospatial learning, social media, and digital devices. Jared's background is in secondary education where he was a Language Arts teacher. He received his Bachelors degree in English and his Masters degree in Instructional Design and Educational Technology from the University of Utah. Since 2006, Jared has worked as an adjunct faculty member for the College of Education at the University of Utah, where he teaches technology integration classes to undergraduate students. Jared also served as the President of the Utah Coalition for Education Technology (UCET) in 2011-2012. Jared's first book Going Google: Powerful Tools for 21st Century Learning was released in March 2012 by Corwin Press. In October 2016, the second edition of Going Google was published. His second book, Classroom in the Cloud, was released in November 2015, also by Corwin Press. Jared is co-host of UEN Homeroom, a fun and informative bi-monthly podcast which tells the stories and talks about the issues impacting Utah’s amazing teachers. "Covili and Provenzano have done a fantastic job of putting together this resource of cloud based tools for teaching and learning. It is a valuable asset to any new teacher, veteran teacher, administrator, or IT leader. 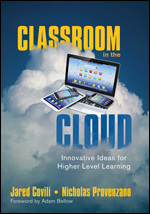 If you want to truly take your schools and classrooms to the cloud this book will get you there!"